Introducing my latest finished project: Skylark Stole from the book, Custom Knits Accessaries, by Wendy Bernard. 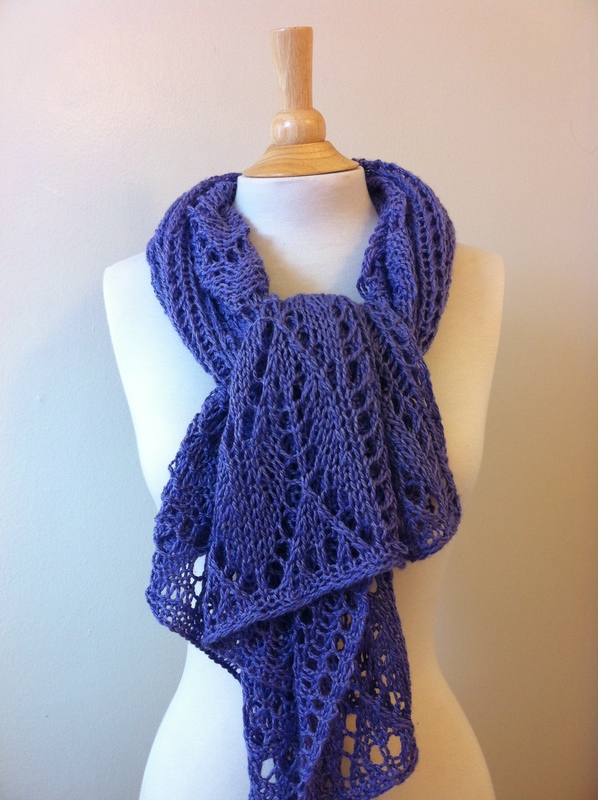 It was knit with four skeins of Frog Tree Meriboo MW yarn in purple (7511). My friend T visited me from Portland a few months ago, and brought with her four skeins of lovely, 70% merino wool / 30% bamboo blend from her neighborhood yarn shop called Dublin Bay Knitting Shop for my birthday. The awesomeness was two-fold: I’ve never worked with these soft blends before and I was dying to try; and this wonderful gift came from a non-knitter! How cool is this? Someone who’s never knit got me one of the softest and lovelies yarns I’ve ever owned! She told me that staff at the shop who recommended this yarn was confident that I would love it. They were absolutely correct about that! Blocking an intricate lace is such a treat. I love watching the design come to life simply with a pull of the blocking wires. This is when you realize your time and energy spent knitting this garment was totally worth it. (It can also be a major heartbreak, however, when you discover a mistake or two you didn’t notice until now … eek!) By the way, I folded the stole in half to block because I didn’t have enough room to stretch out the entire thing flat. As for the knitting, I have to confess that I got confused by the pattern at first. Looking back, I’m a bit embarrassed to even admit this since Wendy’s patterns are always, always impeccable, and this one was no exception. I just didn’t read the direction carefully enough. Mea culpa. My confusion was from the eyelet pattern repeats. I needed to add this 4-sitch eyelet repeat before each, 21-stitch chevron pattern plus one at the end (for a total of four times) and not just at the beginning and the end of each RS row I incorrectly interpreted. Because of this, I had eight wandering stitches that I just could not find a home for! Once I figured it out, knitting this stole was a breeeeeeeze. The pattern is simple but interesting enough that kept me engaged throughout the entire project. I think placing markers after each pattern is key. I recommend that you utilize those little rings as much as possible. I even put one after two garter stitches at the beginning and end of rows for good measure! I had to think of an interesting way to photograph the finished stole. I thought about just laying it flat on the floor to showcase the design but I was afraid that my two year old will get to it and rip it out before my eyes (and she will)! So I decided to just hold it against the white wall. I hope you can see the lovely lace pattern from these photos. Here are other ways that I’ll be enjoying this stole. It’s so versatile, I can wear it as a stole or a scarf. I have a feeling that I’ll get a good use out of this garment all year long!